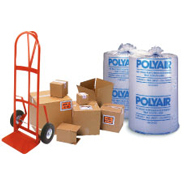 W x Gusset x H: 7 5/8" x 3 9/16" x 5 7/16"
7 5/8" x 5 7/16" x 3 9/16" Outside Tuck Mailers (listed with inside dimensions) are strong and lightweight providing maximum protection for your most important literature and documents. 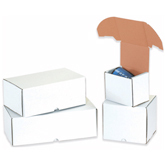 7 5/8 x 5 7/16 x 3 9/16 Outside Tuck Mailers feature protective outside tuck closures. They also fold together quickly without the need for glue, staples or tape. 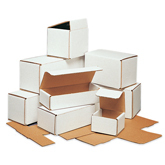 Economical outside tuck mailers are manufactured from 200 lbs./ECT-32-B oyster white corrugated material that can be stored flat, as shipped, 50 per case.